Rookie quarterback Mike Glennon has thrown four touchdowns and four interceptions over the past three games. TAMPA, Fla. — After a day that created more doubt about his development, Tampa Bay Buccaneers quarterback Mike Glennon entered a small room deep at Raymond James Stadium, some agitation in his voice. The questions about his progress are more consistent now, and they were present again after another hot-and-cold Sunday for him. He completed 18 of 34 passes for 179 yards with two touchdowns and one interception in the Bucs’ 33-14 loss to the San Francisco 49ers, a line that forced his coach, Greg Schiano, to announce that the rookie didn’t take a step back despite growing concerns otherwise. Again, Glennon stood behind a podium in a black suit and credited an opposing unit, one that entered third in the league in scoring defense. Again, Glennon said the result disappointed him, echoing his feelings after a loss to the Carolina Panthers in Week 13 that started his skid. "Obviously, I’m disappointed — we lost," he said, somewhat annoyed. "It’s about winning and losing. So yeah, I’m disappointed." 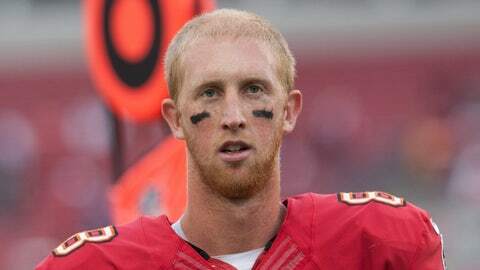 What Glennon has accomplished must be recognized. He’s an upgrade over his predecessor, Josh Freeman, and Schiano’s choice to move past the franchise’s former face of the future was the right move. Freeman, in retrospect, was too broken emotionally to continue in his role, and until Week 13, Glennon had grown as a leader after each test. But there has been a different feel to his play the past three games. In this stretch, he has failed to throw more than 180 yards each time. He has produced four touchdowns and four interceptions, a worrisome trend after he had 13 touchdowns and four interceptions through his first eight starts. The low point came in an ugly effort last Sunday against a capable Buffalo Bills defense, when he completed 9 of 25 passes for 90 yards with two touchdowns and two interceptions. This afternoon was better, though the sparks were limited to two scoring drives of 80 and 92 yards, efforts that were far from enough to spring an upset. "I didn’t think he took steps back today," Schiano said. "The only way we moved the ball is when we went to two-minute and no-huddle (offenses). Mike’s the one who controlled the whole operation, moving it down the field against, arguably, one of the top three defenses in the league." The 49ers’ defense deserves credit. San Francisco’s defenders, for much of the day, harassed Glennon by using their considerable physicality to overpower Tampa Bay’s offensive line. Glennon was sacked four times, twice by linebacker Aldon Smith. The Bucs’ running game, so central to their success, was a non-factor on a day when Bobby Rainey was held to 27 yards on 11 carries (his longest run was 8 yards). "No, (we’re) going against one of the top defenses in the league," Glennon said, when asked by FOX Sports Florida. "As an offense, we knew we were going to have to get the game into the fourth quarter, and we did that. Going against that kind of team, you just have to be on top of your game and all throughout the course of the game." The book is out on Glennon and the Bucs. The secret to stopping them looks a whole lot like it did with Freeman and Doug Martin early in the season: Muzzle the running threat and force the quarterback to beat you. Glennon, for the most part, has yet to prove he can do the job against an elite defense. The victory over the Detroit Lions in Week 12, when he completed 14 of 21 passes for 247 yards with two touchdowns, stands as his proudest moment. The Lions held the Bucs to 22 yards rushing, but Glennon’s play was enough to lift his team to an impressive triumph at Ford Field. Since, though, Glennon has found life to be hard. The Panthers held the Bucs to 66 yards rushing, and he threw for 180 with one interception. The Bills were gashed for 165 yards rushing, but they limited him to 90 through the air with two touchdowns and two interceptions. Is Glennon’s struggle the lone reason for the Bucs’ recent offensive problems? Of course not. Without a more capable rushing threat, the St. Louis Rams and New Orleans Saints will scheme against him in the coming weeks. He has some responsibility to show he can make teams pay for loading the box to stop Rainey. But the Bucs’ offensive line must find a way, somehow, to make their rushing threat relevant. This is a unit-wide issue, not a single man’s. "Stick together," Bucs tight end Tim Wright said. "Those are the type of games that we have to close out and just get back to work on Monday." Glennon began that process late Sunday afternoon in that small room, while revisiting the Bucs’ 10th loss during a two-minute, 50-second analysis of his latest struggle. He had stared at one of the NFL’s best defenses. By the end, the 49ers made him blink. "With that front four and those linebackers," Glennon said, "it’s just first-rounders, Pro Bowlers across the board, and it’s tough." Another Sunday, the same line. Little, if anything, about these last three weeks has been easy for him.